Zion National Park. Cleaved from the heart of the Colorado Plateau the powers that be have hewn some of nature’s best artistry from ancient sandstone then someone named it Zion. Zion National Park oozes the type of beauty that stops us in our tracks, gaping in awe. Zion is gorgeous any time of year but with that extra splash of the reds and golds of autumn make a fine exclamation mark to the grandeur that is Zion. Nature's extreme forces and the violence of wind, rain, wind, snow, and ice have teamed up to created a perfect photographer’s destination. Zion’s Virgin River has carved its way through a couple thousand feet of Colorado plateau sandstone and a 15-mile-long gash that reaches nearly half a mile into the earth. This colorful chasm of ochre and red shades the winding course of the Virgin River as well as the benches and coulees of the descending vertical face sandstone from the harsh desert sun. The juxtaposition of rich mountain vegetation, cold streams and ochre desert rock provides a backdrop for one of nature’s unique autumn displays. The blessings of autumn fire up the bright yellows of the valley’s cottonwoods that line the river and brilliant reds of the mountain maple that grace shadowy hillsides. 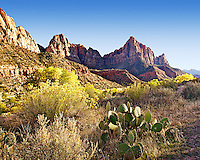 The sculptured cliffs of Zion Canyon provide visitors with landscapes of unmatched beauty and diversity. These unique sandstone cliffs can range in color from cream, to pink, too red.